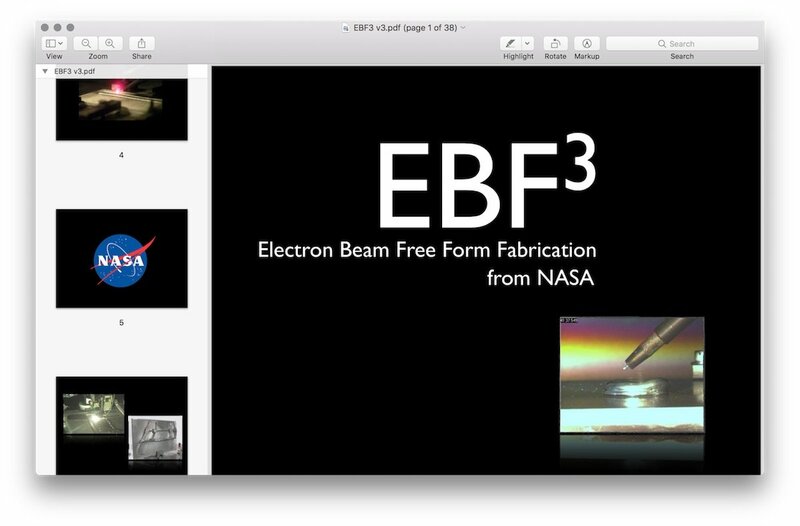 Fifteen minute video explaining NASA’s Electron Beam Free Form Fabrication (EBF3) technology. Created by interviewing co-creator over Skype and adding relevant still images. Facilitated exploratory licensing between NASA and Stratasys, Inc.
Fuentek, LLC is located in Apex, North Carolina and specializes in technology transfer consulting. Electron Beam Free Form Fabrication (EBF3) was jointly developed by NASA's Langley Research Center and Johnson Space Center (JSC). Fuentek had contracted with some NASA centers - including Langley & JSC - for tech transfer consulting and to help them to find commercial licensees for their innovations. This specific challenge was how to explain & promote EBF3. Rather than create a web page with just copy & photos as was often done, we took a different twist for the project. I interviewed EBF3's co-inventor - Karen Taminger - over Skype and had her describe what EBF3 was and what it could do. Then I used project photos, edited the audio from the interview, and created a multi-media presentation. This was a different request for information than Ms. Taminger (Karen) had been expecting, but she quickly became very supportive. Two+ hours of audio interview with Karen was edited down to a little more than 10 minutes. An opening introduction and closing section was narrated and added, along with some background audio to help grab attention. The original multimedia presentation was done both as sound slides and as a video. The sound slides were lost when Slideshare dropped support for audio with timed slides, but the video is still on Youtube. Below is a PDF of the standard promotion web page from Fuentek's website and also the final video. You can see the original slides only version (no audio) - as well as learn more about the project - at https://dougfoster.me/telling-the-ebf3-story/.